Mayor Jacob Frey held a press conference on February 6 to publicly announce the opening of a new 75-unit affordable housing complex in the Hawthorne Neighborhood on Minneapolis’ North Side. The new Hawthorne EcoVillage Apartments, located at 617 Lowry Avenue North, was developed by Project for Pride in Living (PPL) and has been over 15 years in the making. The $18 million complex marks the largest development on Lowry Avenue in over a decade. To be eligible to rent an apartment at Hawthorne EcoVillage, residents cannot make more than 50 percent of the area median income (AMI). In the Twin Cities, 50 percent of the AMI is around $40,000 for a family of four. However, that AMI does not reflect the income levels of residents specifically in the Hawthorne neighborhood. According to data collected by Minnesota Compass, the AMI for the Hawthorne Neighborhood is $22,561. “This is an area that is really economically depressed, so when you use 50 percent of the AMI that is not what many people in my ward and on the North Side are making,” Council Member Phillippe Cunningham said. Cunningham represents Ward 4 on the North Side. He said the City must think more innovatively to get housing that is more deeply affordable. 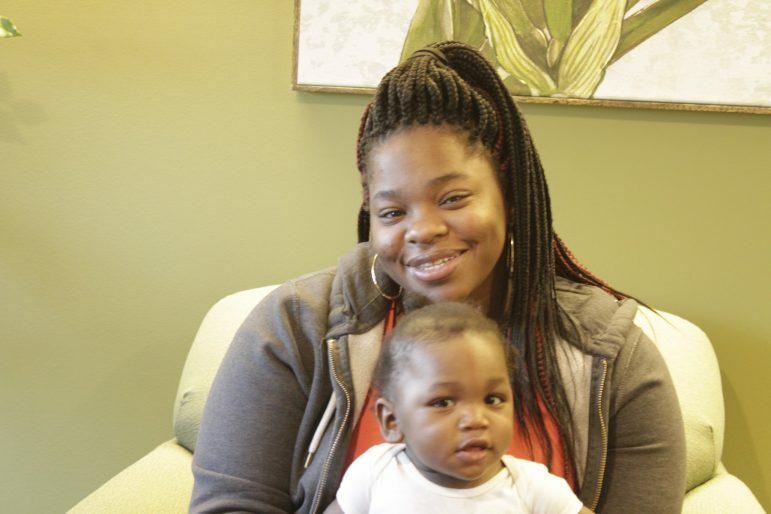 Sondra Samuels, president and CEO of the Northside Achievement Zone (NAZ), an organization focused on ending multigenerational poverty in North Minneapolis, said the 50 percent AMI guideline is a barrier for families who live in the area. “[Our families] are seeing stuff being built around them that is not an opportunity for them,” Samuels said. To make sure the EcoVillage is inclusive to the people of the North Side, PPL included 16 apartments to be set aside for the North Side’s most economically challenged residents. Of the 16 apartments, four are designated for previously homeless people with Group Residential Housing (GRH) subsidies, and 12 are for families working with NAZ. Families who are on GRH receive a base rate subsidy of $893. Out of the $893, the EcoVillage takes $610 for rent, said the senior director of real estate development for PPL, Chris Wilson. 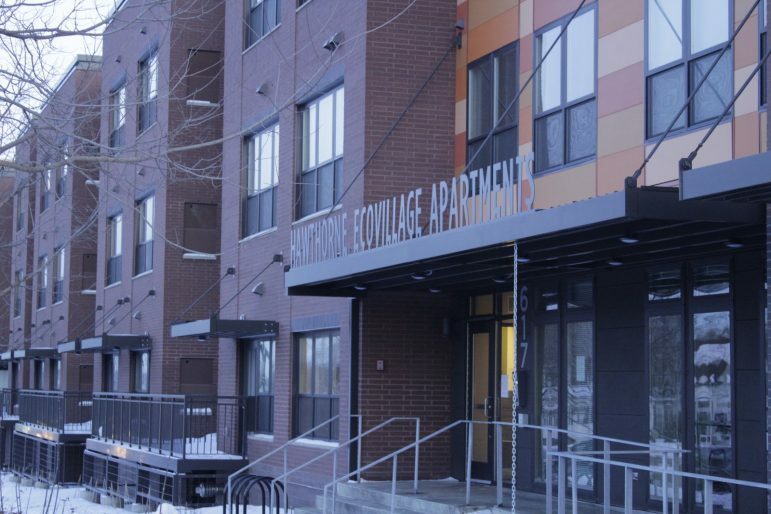 For families working with NAZ, EcoVillage takes 30 percent of their income for rent, which is considered “deep affordable housing.” The other 59 apartments, labeled as “workforce housing,” will have rents ranging from $670 to $950. “I didn’t think I would be blessed to have something like this,” said Vereicha Winfield. “There’s barriers that have got in the way, so I just consider it to be a blessing.” Winfield is one of the 12 families working with NAZ that live in the apartment complex. Before she lived in the EcoVillage she was paying $840 in rent. Now she pays $657 for an apartment in the EcoVillage that would normally cost more than $900 to rent. The complex will include studio, one-, two- and three-bedroom apartments as well as four three-bedroom townhouse units. The “Eco” part of the complex includes a number of green amenities like community gardens, solar panels, and a state-of-the art rain treatment and infiltration system. PPL’s work is focused on developing affordable housing for low-income families throughout the Twin Cities area. When PPL first started conceptualizing the EcoVillage in the early 2000’s, Hawthorne had more empty lots than any other neighborhood in the city, Wilson said. Frey pointed out that the four-block radius occupied by the EcoVillage Apartments adds families and residents to an area that was a “previously underutilized parcel that was fraught with crime.” Council Member Jeremiah Ellison, who represents Ward 5 where the EcoVillage is located, did not respond by press time to questions about the impact affordable housing has on his ward. The EcoVillage Apartments are the culmination of work PPL has been doing in the Hawthorne neighborhood since the turn of the century, Wilson said. PPL won the MetLife Foundation Community-Police Partnership Award in 2010 for its work in the Hawthorne neighborhood. The four-block area that the EcoVillage occupies was identified as one of the “six clusters” on the North Side when the City introduced its cluster strategy in 2003. Each “cluster” paired with one organization to stabilize the area. The idea was to “concentrate on small areas to make a big impact” according to PPL documents. The Hawthorne Neighborhood Council chose PPL as its partner because of the work it had done around housing in the neighborhood for close to a decade. The EcoVillage is bounded by Lowry Avenue to the north, 30th Avenue to the south, 4th Street North to the east and Lyndale Avenue to the west. Keith Schubert welcomes reader responses to keithsch94@gmail.com, or follow him on twitter @keithsch94.